Aijung Kim: Introducing Mr. "Bloom"... and a Giveaway! Introducing Mr. "Bloom"... and a Giveaway! 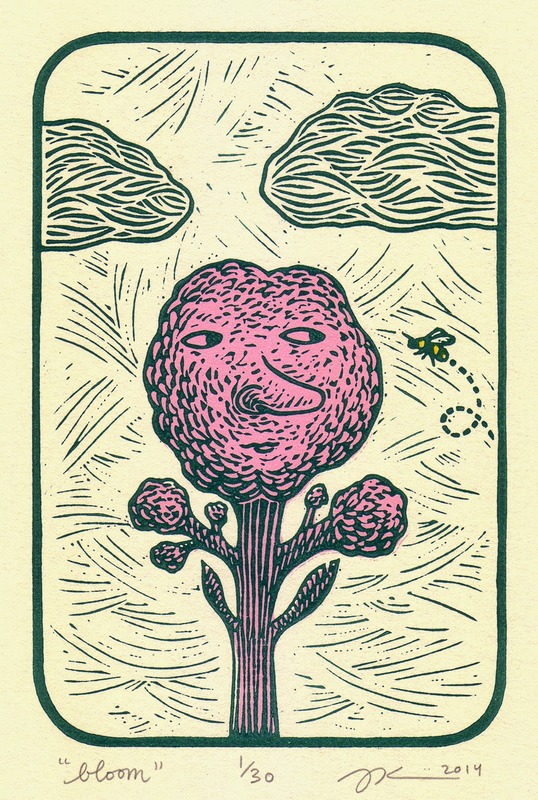 My latest linocut is of a slightly apprehensive broccoli guy encountering a bee. It comes in two different color schemes. 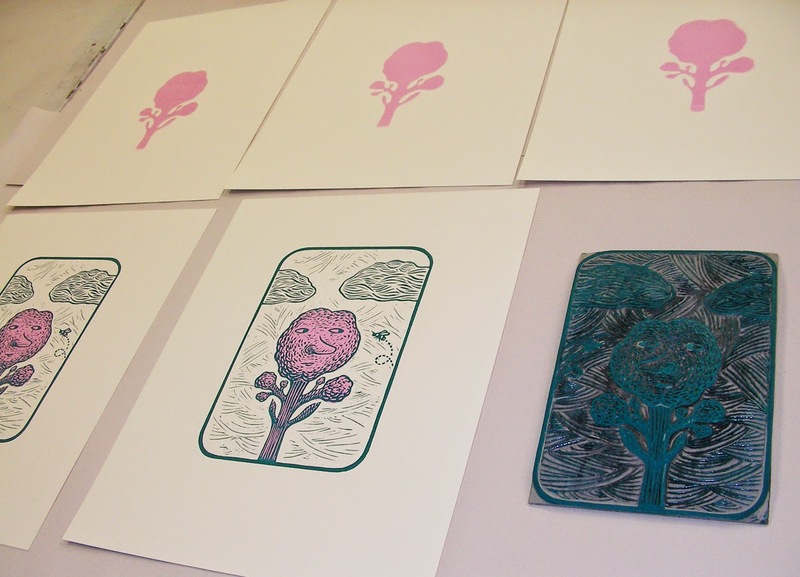 I call the print "Bloom." Personally I think of him as "Mr. Bloom," But I don't want to be too gender-specific with a plant in case some people perceive him as a "she" or an "it." Maybe I'm overthinking it. Anyway, back in 2012 after I successfully launched my Kickstarter campaign to produce The Golden Moth Illumination Deck, I had promised to create 96 small original artworks for backers who chose it in their reward levels. Here are some examples of artwork I created. You can see another vegetable-ish creature in the bottom right corner that looks like an asparagus! I kept the paintings simple. Most started out with me just putting blobs of watercolor onto several papers at once, and then I decided what each blob should become. I kept some of my favorites, including this broccoli guy. Recently I decided to make him into a linocut, because I hadn't done any personal printmaking work in awhile. He looked silly to me because he was so serious-looking. I added the bee to give him more of a relationship with the outside world. For this print, I created a stencil for the green/pink portion of the print and rolled the ink with a brayer directly onto the paper. I made the stencil by taking a piece of computer paper and varnishing it on both sides so it was waterproof and I could re-use it. 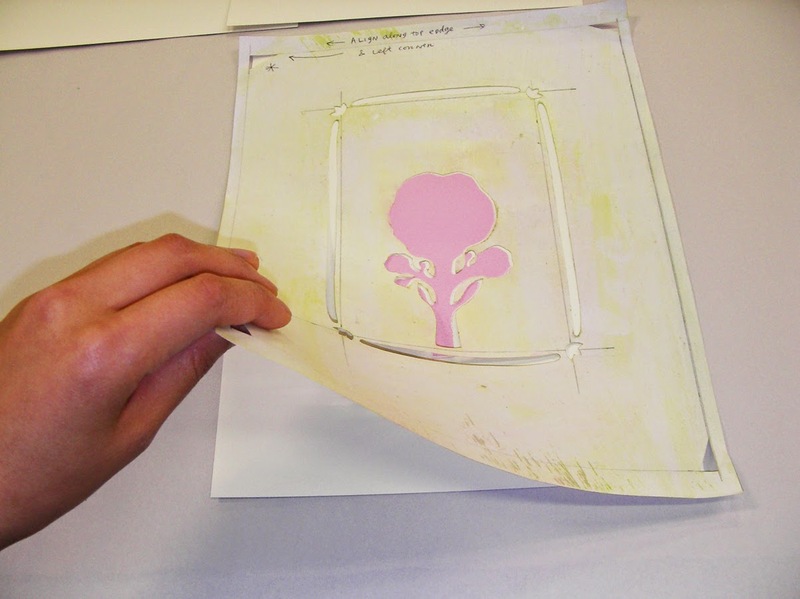 I chose computer paper because I thought that if I rolled the brayer of ink over something thicker like cardstock, the ink might not lay down close enough inside the edges of the stencil. I took this picture after I had already cleaned the stencil, so you can't see the mess of ink on the stencil itself. Also, the border part was printing weird, so I just blocked it out with tape and didn't use it at all. I cut out little right-angle triangles on the corners of the stencil so I could see through to my printing paper underneath and it would line up correctly. 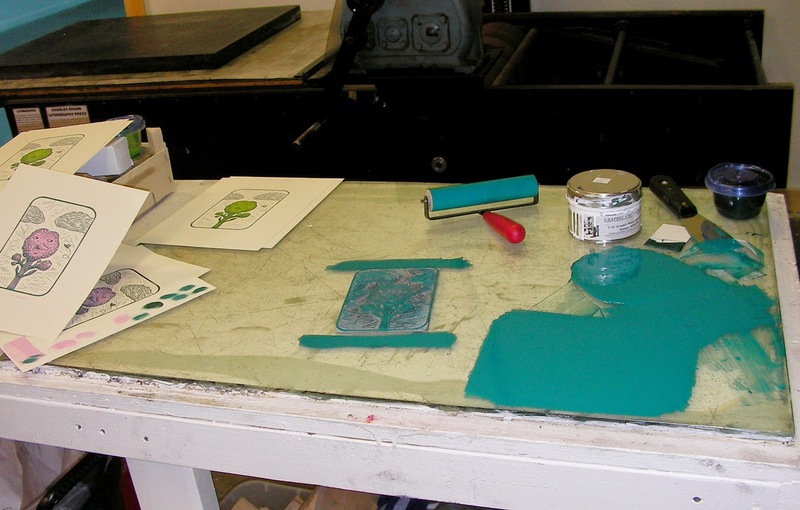 It took me a couple proofing sessions to figure out the greenish-blue I wanted for the linocut. 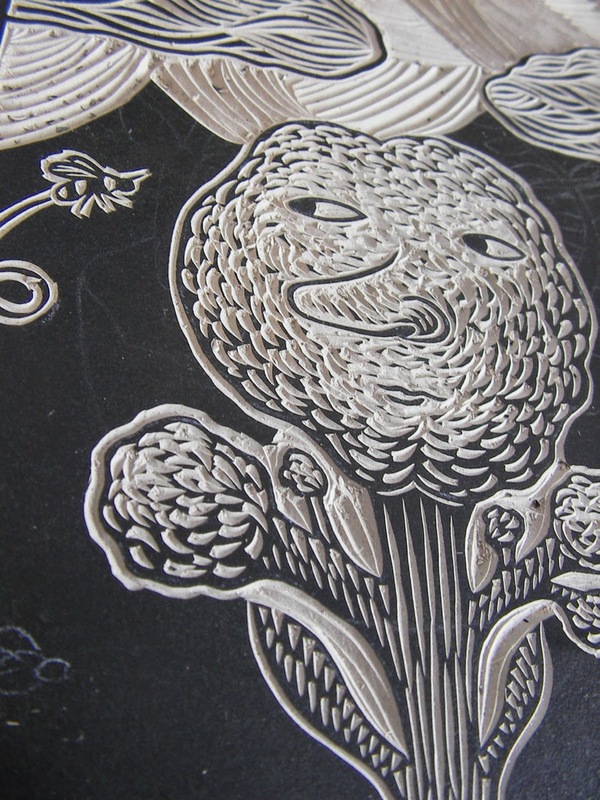 Then I took it to the etching press and printed the linocut on top of the stencilled part. Ta-da! I also added the yellow to the bee with colored pencil. If you like Mr. (or Ms.) Bloom and want him/her to be part of your world, please enter my giveaway! 1. Please visit my online shop, Sprout Head, and leave a comment on this post telling me both what your favorite item/s are in the shop and why, AND what you'd like to see more of (either something similar to what you see already or an entirely new product that you want me to make). 2. "Like" my Facebook page! If you want to be the first to get notifications on the Sprout Head page, also make sure that after you "like" my page, click on "liked" and scroll the drop-down menu to click on "Get notifications." Otherwise, you may not always see updates from my page on your news feed. - Blog about the giveaway on your blog. - Pin an image of "Bloom" on an appropriate board on your Pinterest page. You may pin from this blog post, or from the Etsy listings here: pink and green versions. REMEMBER, you must do only the FIRST THREE of these things to have your name entered once into the giveaway! GIVEAWAY CLOSES ON MONDAY, MAY 26th AT MIDNIGHT EST. Hi there. Thanks for offering this giveaway :) My favorite items are your note cards. Especially the one called Zoom. I like the softness, if that's the word, of the colors and it has the right amount of cuteness. I love tshirts and tote bags and would love to see your images on things like that. Thanks again! I forgot to write why I like these things. 1) It's the amount of detail in the pattern that is really interesting & green and blue are two of my favorite colors 2) the cards tell stories by bouncing off one another and the story is always changing 3) I like how you illustrate people and I like how I feel a strong sense of emotion from this piece 4) your zines are really fun to read and the illustrations are rich and complex even though they are on such tiny pieces of paper. With "Bloom" I like his expressive face, especially in relation to that bee. What a lovely print! The green one is my favorite. :) I'll pass on the giveaway since I don't use facebook and I've already won one of yours before--I want to share the love! Keep up the good work. Hi Michelle, feel free to enter even if you don't have Facebook. i'll count you in as long as you share it with other people and leave a comment about my shop. thanks! I am also enthralled with your deck. 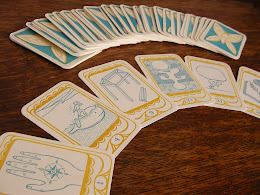 The Golden Moth deck is lovely. I enjoy all of your work, but your books have my heart. 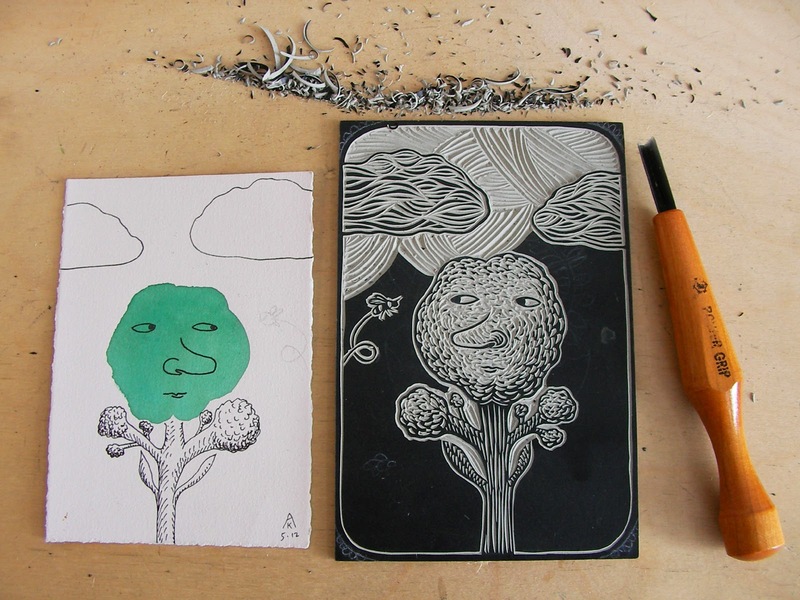 I think you should follow your inspiration -- your linocuts of people and nature are both wonderful. Hi there!!!! I am a big fan of the black and white prints. Also, I'm really into the plant and vegetable prints. I would love to see more of the two.